On Friday Oct 4/13 a gentleman sets himself on fire, otherwise known as self-immolation, on the National Mall in Washington. A day later he dies and has to be identified through DNA testing. Now the investigators are scratching their heads in wonderment over why he might have done this. The act of self-immolation as a form of protest has been going on for longer than many of us remember. It has become a regular event in Tibet. Since March of 2011 there have been over 100 cases of this type of protest. I do not believe anybody scratched their heads when Mohamed Bouazizi set himself ablaze in Tunisia. It was automatically recognized as desperate act of protest but it did spark Arab Springs. So why should the act on North American soil be seen as anything different? With that said does anybody out there recognize the above picture? If you do you are probably 50+. If you don’t then you should. If you want to avoid the possibility of repeating history get to know your past. Before the Arab Spring there were the American protest marches. People were beginning to stand up to their government through protest and making demands that there government listen to them beyond the polls. The war in Vietnam (actually classified as a “police action”) was pushing the average American to the edge of their tolerance and the brashness of youth was spilling over on universities campuses from one coast to the other. A large segment of the population were tired of seeing their young ones come home in body-bags from Vietnam. There were anti-war protests happening from coast to coast and universities were rife with unrest. 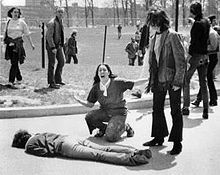 During one such protest at Kent State University the National Guard were called in (as had happened at many universities) but this time they opened fire. This resulted in four deaths and many more wounded. Now keep in mind these protestors were unarmed university students. What initiated this protest? President Nixon’s move into Cambodia from Vietnam. The people were tired and those most at risk, youth, were not going to take it anymore. What happened at Kent State, and if you are not aware of the history then read it, spilled over causing almost five hundred other universities to shut down briefly. The outcry over this was heard from ocean to ocean yet the Justice Department initially refused any type of grand jury hearings. A short time after that another incident involving the National Guard resulted in two more deaths and nine wounded at Jackson State University. These student, an all black university, were also doing nothing more than protesting. The civil rights movement was swelling by then however universities still existed where black students were not allowed to apply. This forced the federal government to finally investigate and the above picture was one that was presented as evidence during the hearings. This particular picture went on to be one of the most viewed pictures of its time including being featured on the cover of Life magazine as picture of the year. It also became a Pulitzer prize winning picture. I write this today as a reminder that we did not achieve many of the freedoms we enjoy today by hiding away in the comfort of our bubble. We enjoy them because many people have died to attain them and others have died to protect them through the simple act of protest. To me this isn’t ancient history. It happened in my life time and I walked, crutches and all, in many of those marches. I cannot sit back now and watch while our rights and democratic process are slowly being eroded. I would like to suggest that every person born since 1980 do a little history review. The 60’s and 70’s were about a lot more than drugs and free love. There were serious issues being tackled in between acid trips. Now ask yourself why would someone set themselves on fire at the Washington Mall? I don’t think the answer is rocket science. This entry was posted in Personal Life, Politics and tagged Arab Springs, Canadian politics, Charter of Rights, erosion of rights, Just one man's opinion, Kent State massacre, Mohamed Bouazizi, Obamacare, social activism, Stephen Harper, Terry Wiens. Bookmark the permalink.